On Site registration opens at 7:30AM November 2nd. David Gage, Ph.D. and Donna Gage, Ph.D.
Workshop Level: All Levels- This workshop is intended for all mental health professionals, or students, from beginning to advanced. No mediation or particular level of clinical skills is required. This engaging 3-hour workshop will introduce mental health professionals to the practice of mediation, highlighting the many established areas of mediation that are particularly salient to professionals with mental health expertise. These areas include the most familiar (i.e., divorce mediation), and many other areas as well, such as families, family businesses, business partners, workplace mediation (e.g., between co-workers) and elder mediation (relating to aging parents, their care, and their estates). What is common among these areas and what makes them perfect for mental health professionals is their relational and emotional aspects. The workshop will include case studies, a mediation demonstration by the co-presenters and participant role plays. While not mediation training, which is typically 4-5 days long, this workshop will give participants a clear understanding of what mediation is and how it can be beneficially added to one's practice. It will also cover the finances of mediation, marketing, co-mediation, psychological tools commonly employed, where and how to get training, and the challenges and advantages of adding this skill to one's repertoire. Describe the marketing and finances of this service, as well as training opportunities, co-mediation, and the psychological tools commonly used in meditation. 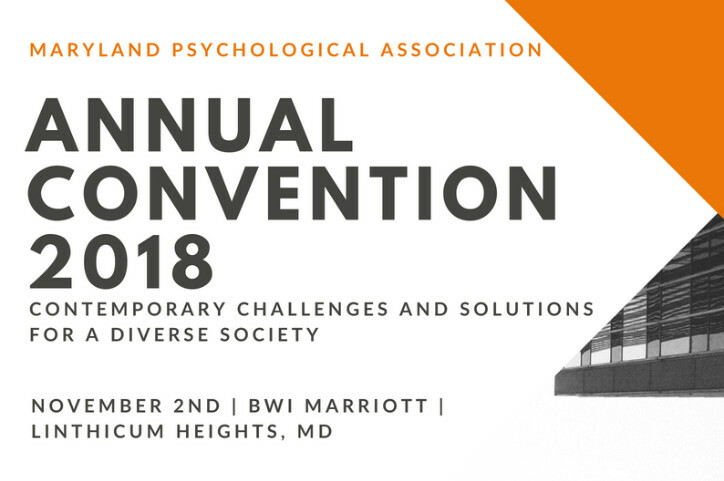 This workshop meets the Maryland licensing requirement for activities designed to enhance competence in the provision of psychological services to culturally diverse populations. Workshop Level: Intermediate to Advanced. See the literature below for basic information assumed to have been read by attendees. This workshop will initially focus on ethical aspects associated with neuropsychological evaluations of children and adolescents from Hispanic backgrounds, underscoring ethical principles and guidelines from the American Psychological Association and other entities. Next, the workshop will examine selected mechanisms capable of elucidating how cultural and contextual factors may be assimilated by the brain using animal and human examples to show that “culture is in the brain.” Historical factors and patterns of American immigration then will be covered emphasizing their impact on neuropsychological assessment, including the development and application of normative samples for instruments to be used with these populations. The workshop will present and discuss important psychometric factors to take into consideration including the reliability and validity of inferences derived from instruments impacting these evaluations. The workshop will subsequently examine important problems encountered and ways to eliminate, mitigate, or reduce the effects of such problems during the course of evaluations. Although the examples will unequivocally draw from work with Hispanic youths, it will in some instances address issues with children and adolescents from “mainstream society” not typically or particularly thought of as individuals from diverse groups. Identify a variety of structural and procedural factors capable of eliminating, mitigating or reducing potential confounds during the course of assessments with Hispanic populations. Workshop Level: Intermediate. No prior knowledge of motivational interviewing is necessary. The workshop is designed for therapists wanting to expand their clinical skill set and gain an understanding of the change process in psychotherapy. Common presenting issues in psychotherapy involve ambivalence around problematic behavior change. As therapists, this is often frustrating leading to clinicians feelings of being of a limited resource, futility and, over time, burnout. Supported by more than 200 randomized clinical trials, Motivational Interviewing (MI) is a collaborative conversation style for strengthening a person's own motivation and commitment to change. While the original use of MI focused primarily on addictions, the subsequent 30 years and more than 1,300 publications have elucidated a myriad of problem behaviors across healthcare settings that are responsive to MI interventions. This workshop will present attendees with a conceptualization of change based on the Transtheoretical Model of Behavior Change as well as new clinical skills to promote change (including change in thought patterns). Discussion of challenging clinical circumstances, the importance of understanding and measuring a client's temporal stage of change and the most effective therapeutic interventions to promote change will be addressed. Through the presentation of clinical skills, attendees will increase their repertoire of clinical skills to increase treatment involvement and the likelihood of behavior change as well as decrease potential burnout. Recognize and address more subtle "stuck points" in the therapeutic process. Workshop Level: All Levels. The workshop will be relevant to clinicians at any level of experience and expertise. This workshop is full! Please contact the MPA office to be added to the wait list. Suicide contagion is a well-documented phenomenon, especially among youth, but most of the related research has addressed suicide as it is depicted from a traditional, non-fiction media perspective, such as in print articles and editorial commentary, a though radio and television reporting. There is little specific or longitudinal research on, for example, the effect of fictional portrayals of suicide in creative, online content, which is often "binge-watched" and perpetually available for repeated exposure. This workshop will explore the influence of the Internet and social media, and popular culture in general, on child and adolescent mental health. It will not only examine suicide contagion specifically, but explore many of the other themes and subjects that are regularly illuminated in the media and designed to appeal to children and adolescents, and that are of particular relevance to mental health, including bullying, heartbreak and rejections, sexual assault, physical abuse, gun violence, racial and sexual stereotyping, drug and alcohol abuse, gaming, LGBTQ issues, depression and anxiety. The focus of our conversation will be on the ways in which new forms of media introduce new threats to healthy child and adolescent development, but also on the ways in which clinicians can deploy these same innovative media technologies to mitigate the negative impact of provocative content, and simultaneously provide greater and more strategic opportunities for outreach, support, and assistance to vulnerable children and their families. The workshop will also present for discussion a constellation of both practical and ethical questions regarding our responsibility as a professional organization, and as individual practitioners, educators, parents, and citizens, when we do not yet have solid epidemiologically-based conclusions and directions to guide us, but when there is compelling anecdotal evidence to support the likelihood that pediatric mental health is being imperiled by some of pop culture's most engagingly popular stimuli and productions. Design, assemble and discuss public health strategies that can more effectively reach and support youth and families who may be deleteriously exposed to popular culture. This workshop meets the Maryland licensing requirement for Ethics/Laws/or Risk Management. School shootings are being reported almost weekly and in 2018 are increasing over previous years. To prevent youth violence from persisting through adolescence and adulthood, we need to use validated tools to measure risk and resiliency factors and create risk reduction plans. These methods are best employed in childhood and adolescence where developmental progress can still be made at in a relatively rapid pace. In the adult populations, it is necessary to use skill-building activities for the skills missed in the early and middle childhood development period. Therefore, one might start with the precursors of prosocial behavior, such as trust, reciprocity and delayed gratification (ages 0-4). Those that are prone to violence often have histories of abuse, neglect, and exposure to violence in early childhood leading to multiple skill deficits in adolescence and adulthood, such as a lack of empathy. Theoretical underpinnings are found in Bessel Van Der Kolk's conceptualization of a developmental trauma disorder and/or Dr. Courtois' conceptualization of complex trauma. Both involve early childhood trauma where the skills building and brain development are absent or weak. There are four validated violence risk assessment tools on the market today: SAVRY, PCL-YV, LS-CMI, and the CARE-2. They all have similar risk and resiliency factors as well as static and dynamic factors because these factors have been well defined in the literature over a decade. Measures of this kind should also include a risk reduction plan based on risk and resiliency factors to reduce the risk of future violent acts by youth. The most often used tools for assessment of this population will be examined and presented with pros and cons for each. Topics in this presentation include evidence-based and promising treatment modalities. The theoretical underpinning will also be presented. describe treatment modalities for youth at risk for violence. Workshop Level: All Levels. This workshop is for licensed psychologists who want to know about prescribing medical psychology and the state-of-the-art in combining and integrating pharmacotherapy with psychotherapy. The workshop will also include information about the evidence base for the interventions that have been tested in clinical research studies. Lastly, this workshop will provide information about the origins of Prescribing Psychologists, federal regulations, and State legislative efforts to expand this scope of practice over the last 20+ years. The integration of psychotropics into a broader psychosocial therapeutic plan would seem more than justified by previous reviews of the benefits associated with such a multimodal approach to coordinated behavioral health treatment. It is no longer enough to think along traditional lines of which is the best medication for a particular diagnosis, nor is it sufficient to adhere to one school of psychotherapy and apply it without much regard to diagnosis. Thus, CBT for CBT's sake, just as pharmacotherapy as a standalone, would appear to be paradigms with diminished futures. Evidence-based therapeutic strategies argue that treatments, or a combination of treatments, might best be selected according to their relative impact on a certain constellation of symptoms, together with accompanying psychosocial variables, not the least among these being subject variables. Such an approach advocates integrating different biopsychosocial approaches to optimize the therapeutic result. In some instances it is a question of selecting one treatment over another, while in the majority of cases it is more a question of combining treatments; and often this means coordinating multimodal therapeutic interventions. Prescribing medical psychology, a subdiscipline within health/medical psychology, integrates biological interventions, with psychosocial therapies, guided by evidence=based practices that medical psychologist have become increasingly implicated in researching. Discuss a historical perspective of RxP political action, including developments in the Federal and State regulatory and legislative activities. Concussions or mild traumatic brain injuries have received significant attention over the past decade with greater recognition by the public as well as the health, school, and sports/recreational institutions. Health professionals are being asked to support the injured child/adolescent’s active recovery, requiring appropriate knowledge and skill in guiding this process. New guidelines have been issued that promote a more active rehabilitation approach to recovery. Recovery is influenced by many factors including the pre- and post-injury psychological status of the person, as well as age and gender. Psychologists are well suited to support this recovery process through the application of our assessment expertise and treatment models. Key manifestations of concussion in the child/ adolescent’s life will be discussed including active management and gradual reintegration into school. Through lecture and case scenarios, participants will learn the assessment of signs and symptoms, symptom-targeted intervention planning, monitoring, and prevention strategies. Recent evidence-based guidelines will be applied and a toolkit will be provided to guide the clinician’s practice. Develop symptom-targeted management/ intervention plans to facilitate recovery. This workshop meets the Maryland licensing requirement for activities designed to enhance competence in the provision of psychological services to culturally diverse populations or Ethics/Laws/or Risk Management. As the nationwide conversation about immigration has intensified, immigration courts and attorneys are looking to mental health professionals for assessing individuals applying for a variety of immigration benefits. This workshop will teach the fundamental aspects of providing such an evaluation. It will address some of the cultural and ethical issues involved. Participants will learn about the most basic types of immigration benefits where psychological evaluations can be relevant. These include: asylum, hardship waivers, VAWA self-petition (Violence Against Women Act), U Visas (for victims or witnesses of crimes) and T Visas (Trafficking). We will review some of the most common instruments utilized in these assessments. This will include a brief discussion of PTSD. The workshop will also address what questions such as an evaluation can or cannot answer. Participants will learn how to integrate assessment findings into a written product which addresses the questions around immigration. Write a psychological evaluation that addresses concerns specific to immigration issues. Hair Pulling Disorder (HPD), also known as Trichotillomania, and Skin Picking Disorder (SPD), also known as Excoriation Disorder are types of body-focused repetitive behaviors (BFRBs) that affect millions of people worldwide. As many as 1 in 50 people engage in non-cosmetic hair pulling that results in significant hair loss and person distress. Other BFRBs, such as skin picking and nail biting, are thought to affect an even greater percentage of the population an can result in scarring, infections and medical interventions including plastic surgery. This workshop will provide an overview of BFRBs and their treatment and will highlight recent research findings. The primary focus of this workshop will be to describe the use of Comprehensive Behavioral (ComB) treatment for these disorders. ComB treatment is an evidence-based therapeutic approach created by the presenter, described in a number of professional publications and widely used by hundreds of clinicians worldwide. Case vignettes will illustrate how to implement treatment consistent with the ComB approach and with the needs of the client. Apply the ComB approach for assessment and treatment of HPD and SPD. Workshop Level: Beginning/Intermediate. Familiarity with common mental health issues of young adults and family systems theory will be assumed. Currently, more young adults live at home than any other time on record- and many of them say they are satisfied with this arrangement. Transgenerational expectations for how Emerging Adults (EAs) should "progress" in life don't apply like they used to, as today's EAs are different than the EAs of any other generation. Cultural, economic, healthcare, educational, and technological changes have pushed back the clock for identity formation, education, employment, marriage, and financial independence. For many, this new path is paved with opportunities including college, internships, vocational training, or employment. But for some, this stage of life is more struggle than success, with starts and stops, wrong turns, and seeming dead-ends. This workshop will review the current treatment approaches for working with struggling EAs. We will review key assessment factors, and both individuals and family treatment strategies to help EAs and their parents take steps forward. Particular attention will be paid to the "underlying issues" negatively impacting this population, including mental illness and family dynamics. We will discuss adjunct services and community resources to support and enhance your treatment, as well as interventions for difficult-to-engage EAs. The focus of the workshop will be on assessment, clinical intervention, identifying adjunct support/intervention, and case study. Plan when and how to include adjunct support and intervention. Workshop Level: Beginner/Intermediate- Some familiarity with couples counseling or at least couples counseling literature would be preferable. Infidelity is a common reason why couples seek therapy, due to the betrayal, sadness, and anger that stem from the discovery of emotional and/or physical infidelity. Often practitioners themselves are triggered by the idea of infidelity, or subconsciously ally with the spouse who was betrayed, which may not help the couple most effectively. This workshop will draw from the intriguing recent literature on relationships, monogamy, and infidelity, and is designed to help practitioners feel more objective about the reasons that infidelity can occur, identify common ways that couples respond after infidelity, and grow more confident in their ability to guide clients through the recovery from an affair. The focus will be on case vignettes, relevant literature, and theory, rather than research data. Create a strategy to help a struggling couple reconfigure their relationship post-affair. Workshop Level: Beginner/Intermediate- This workshop is ideal for individuals with little exposure to cultural diversity and South Asian communities outside of their work life. South Asians are a growing community in the US. In 2005, the Washington DC area had the 5th largest South Asian population in the country (Census), while there still tends to be a lower help-seeking rate for South Asians to seek and continue therapy options. Practitioners can benefit from being familiar with South Asian community cultural context and mental health difficulties, as it relates to mental health and therapy to help improve individual services. This session is created to give participants an overview of the South Asian/ South Asian American community, cultural context, cultural values, and belief systems that are relevant for practitioners and therapists. Additionally, the session will have participants explore their own reactions, stereotypes, and biases that may impact their therapeutic work. The session will start with an exploration of participant experiences and participant reflections and exploration of reaction to South Asian communities, a brief overview of diversity within the South Asian community and experiences in the US, and community-specific information related to mental health concerns. Through experiential exercises, case examples, and discussion, participants will recognize their own potential challenges working with this community based on their own social identities, gain an appreciation for the complexities (strengths and challenges) South Asian/South Asian Americans bring to the therapeutic context, and how therapists and practitioners can positively impact heir South Asian/South Asian American client work. Apply culturally and community relative knowledge to client work with South Asian/South Asian Americans.